A DICTATION MACHINE is a sound recording device most commonly used to record speech for later playback or to be typed into print. It includes digital voice recorders and tape recorders. The name "Dictaphone" is a trademark of the company of the same name, but has also become a common term for all dictation machines, as a genericized trademark. Digital dictation is a method of recording and editing the spoken word in real-time. The recording is done by the use of a digital recorder. Digital recorders are lighter, have a longer battery life and are able to record for a lot longer utilizing the same media, as compared to analog tape based dictation machines. The files generated with digital recorders vary in size, depending on the manufacturer and the format the user chooses. The most common file formats that digital recorders generate have one of the extensions WAV, WMA or MP3. 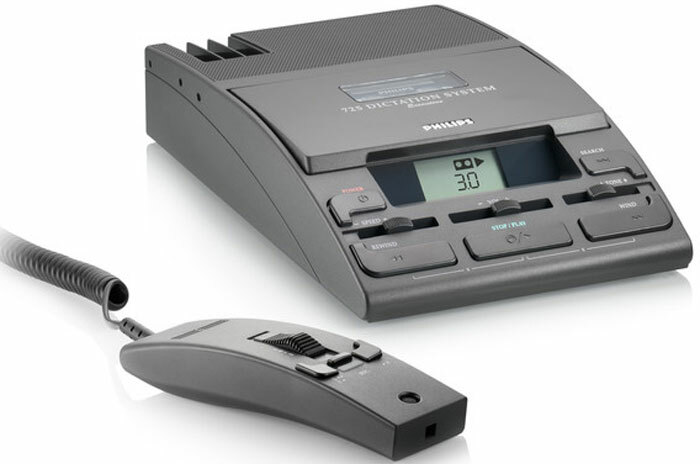 True dictation machines record in the DSS and DS2 format. The DSS and DS2 file formats compress audio allowing for greater portability. In some cases, speech is recorded where sound quality is paramount and transcription unnecessary, e.g. for broadcasting a theatre play; such recording uses techniques closer to high-fidelity music recording, rather than those discussed here. In digital recording, digital audio and digital video are directly recorded to a storage device as a stream of discrete numbers, representing the changes in air pressure (sound) for audio and chroma and luminance values for video through time, thus making an abstract template for the original sound or moving image. Analog audio (sound), or analog video made of a continuous wave must be converted into a stream of discrete numbers, representing the changes over time in air pressure for audio, and chroma and luminance values for video. Best Digital Voice Recorders of 2017 - Digital Voice Recorder Review. Google's new text-to-speech service has more realistic voices - engadget. HOW TO RECORD CALLS ON YOUR SMARTPHONE - Wired. Sound Devices Recorders - since 1998. "Manufacturer of specialized audio and video for production." Portable production sound products including audio mixers, digital audio recorders, wireless microphones and related equipment for sound professionals. All models. DICTAPHONE ENTERPRISE SPEECH SYSTEM - Nuance. DRAGON DICTATION App - "Stop typing, and start speaking." Use your voice to dictate a text message or email, create Facebook status updates or a tweet, and anything in between. Simply speak and see your text content appear. Download Dragon Dictation for iOS now. OLYMPUS - analog, digital, PCM and professional dictation recorders. All models. PHILIPS DICTATION SYSTEMS - "Sense and Simplicity." Professional dictation solutions and voice recorders. Desktop dictation. PHILIPS DICTATION SYSTEMS - "Sense and Simplicity." Professional dictation solutions and voice recorders. Mobile dictation. SONY - digital voice recorders. All models.